BELLEVUE, Wash., Dec. 8, 2017 /PRNewswire/ -- Nintex, the recognized leader in workflow and content automaton (WCA), is pleased to announce receipt of another in a series of 2017 industry awards. Nintex was awarded the Aragon Research Innovator Award for its outstanding technology innovation in Workflow and Content Automation at the Aragon Research Award Ceremony and Holiday Reception in Redwood City, Calif., on December 7. Aragon also recognized Nintex Senior Director of Corporate Communications Kristin Treat as a 2017 Women in Technology Award recipient for demonstrating the highest degree of leadership and for serving as a role model on what is possible for women in technology to achieve. "We are pleased to recognize Nintex for the second year in a row as an Innovator in the emerging category of Workflow and Content Automation, a category it helped to pioneer," said Jim Lundy, Founder and CEO of Aragon Research. "Nintex was recognized for its continued efforts to make it fast and easy to automate content across the entire document lifecycle." 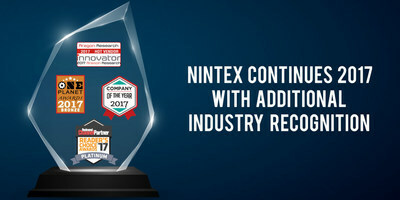 In recognition of its technology innovation and leadership, Nintex also received the Business Intelligence Group's BIG Award for Business as 2017 Company of the Year for the company's leadership in the technology industry and a bronze One Planet Award in the Company of the Year category for enabling organizations to automate, analyze and optimize business processes. Additionally, Nintex was named a Platinum Reader's Choice Award winner (the highest award level) in the SharePoint Tool Category by readers of Redmond Channel Partner. More on the RCP Reader's Choice Awards 2017 can be found in the November/December edition of the publication. While earlier this year, the Nintex Workflow Platform was named Best Workflow Tool in 2017 by Editors at Redmond Channel Partner and received a 2017 Tech Impact Award in the emerging technology/productivity category from Seattle Business Magazine. The company's cloud-first platform, Nintex Workflow Cloud®, received a 2017 Golden Bridge Award in the Best Product, Services, Innovation of the Year category. "Nintex is honored to be recognized by Aragon Research for technology innovation and leadership in 2017," says Nintex CEO John Burton. "We're committed to making it easy for information workers to keep working in their primary applications like Adobe, Box, Dropbox, DocuSign, Office 365, Salesforce, SharePoint and more – using Nintex as the solution to unify workstreams while also allowing workers to participate in larger automated processes from those applications." Nintex has a successful history of automating processes in the Microsoft ecosystem with product offerings for SharePoint and Office 365, which recently surpassed 50 million workflow executions. The company's momentum with workflow and content-centric automation continued in 2017 as it brought WCA offerings to customers of Box and Salesforce. Workflow Automation – easily digitize and streamline important business processes inside and outside organizations with an intuitively designed drag-and-drop workflow design canvas using clicks not code. Document Generation – save time by efficiently merging data from any system of record into any common document format by quickly automating and standardizing the production of dynamic, data-driven documents with easy-to-use tools. Modern Forms – easily build and design dynamic branded forms once and capture critical information; forms render elegantly on any device to ensure a consistent end-user experience and work online and offline. Process Intelligence – move beyond process automation to process optimization with an enterprise-grade workflow analytics service, Nintex Hawkeye®, that gives businesses unprecedented access to intelligence about automated business processes; pre-built and customizable dashboards (lenses) offer users a clear view of where assets are located, with the new Inventory Lens, that give them the ability to derive actionable insights to drive greater business efficiencies. Nintex is the recognized global leader in workflow and content automation (WCA) with more than 7,500 enterprise clients and 1,700 partners in 90 countries who have built and published millions of workflow applications. With its unmatched breadth of capability and platform support delivered by unique architectural capabilities, Nintex empowers the line of business and IT departments to quickly automate hundreds of manual processes to progress on the journey to digital transformation. Nintex Workflow Cloud®, the company's cloud platform, connects with all content repositories, systems of record, and people to consistently fuel successful business outcomes. Visit www.nintex.com to learn more.